Responsibility [rɪˌspɒnsəˈbɪləti] is generally taken to mean the assignment of a duty to an actor or group of actors (subject) towards another person or group of persons (object) based on a normative claim that can be asserted via a designated body. 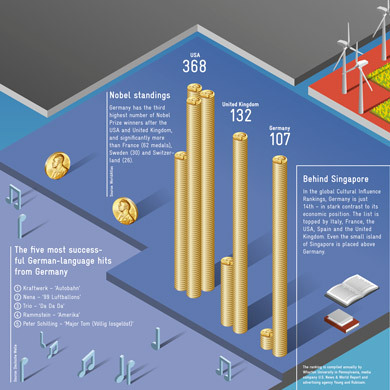 Infographics: Germany presents many faces to the world – and has a few surprises up its sleeve. Amel Saidane from Tunisia and Victor Andrusiv from Ukraine were two of around 150 people who took part in the GIZ study ‘Germany in the Eyes of the World’. For the third time, GIZ has interviewed people across the globe to find out about their perceptions of Germany.